We will begin manufacturing once your order has been processed. The estimated number of days it will take to make and ship each of your products is indicated for each item in your shopping cart. Different types of window treatments are often made in different manufacturing facilities. For the fastest delivery, we ship each product to you as soon as it is ready. That way, you'll have your order as soon as possible. Most products are shipped via Federal Express or UPS. Oversized items will be shipped via freight carriers and may incur additional costs. Unfortunately, we are unable to ship to PO, APO, or FPO boxes. Generally, we do not ship on Saturdays, Sundays or national holidays. Shipping and handling charges are FREE to all states except Alaska and Hawaii. Orders shipped to Alaska and Hawaii will have a 20% surcharge. As soon as your item(s) have shipped, we'll send you a Shipment Notification e-mail that includes the carrier's name and a tracking number, if available. You may also view this information via the order tracking page (tracking online orders requires you to log into our website). If you ordered multiple items, you may receive separate shipments as well as separate shipping e-mail notifications. The Lowe's Custom Blinds & Shades Store sells and ships products only within the fifty States of the United States of America. No shipments can be made to APO or FPO addresses, United States territories/possessions, or addresses outside the United States. 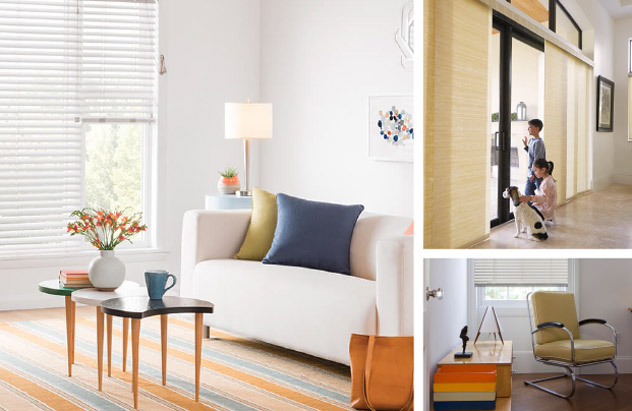 Simplify your ordering experience with free shipping from Lowe's Custom Blinds & Shades. We provide free shipping within the 48 contiguous United States. Exclusions apply. Lowe's Custom Blinds & Shades offers free standard ground shipping on all orders shipped within the contiguous United States. Any additional shipping surcharge is not included. Free shipping does not include oversized freight or shutter orders. Orders are shipped via (UPS) United Parcel Service or (FedEx) Federal Express. Shipments cannot be made to PO Box addresses. Oversize freight orders, typically shipped via common carrier, will incur a freight surcharge. Freight surcharges apply to all shipments to Hawaii, Alaska and Puerto Rico. Due to package weight, free shipping does not include shutter orders. Charges are assessed on each shipment group so more than one surcharge fee may be applied to one order. *Over sized freight size requirements vary by brand. **Over sized freight surcharges vary by brand. Shipping to Alaska, Hawaii and Puerto Rico may be offered at a flat rate of $30 to $50 (depending on brand) for each window treatment. An additional surcharge, listed in the section above, will be applied for oversized shipments. Additional shipping costs will be applied for shutter orders. All shipping fees are calculated at time of order and provided during the checkout process. At this time Lowe's Custom Blinds & Shades does not ship orders outside of the United States and Puerto Rico.